Students Choose The Next Learning Destination With Formative! An example of a pre-assessment Kayla made. Tag questions to standards for tracking student growth across formatives! 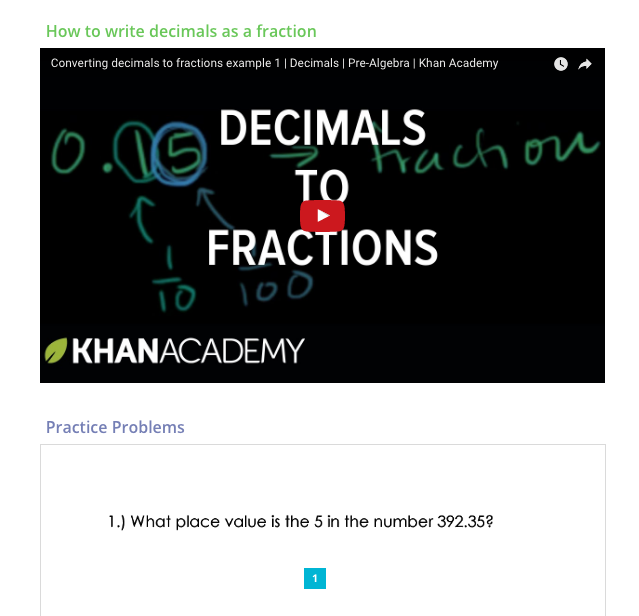 Here's a learning playlist where students watch short instructional videos and then practice. Kayla is able to see their live responses so she can support them. Students get to learn more about each destination as they proceed! Her overall approach is awesome because it invites students to self-assess and practice skills at their own pace. We want to be in your class Kayla! We cannot talk enough about the benefits of error analysis. Learning happens when mistakes are made and what better way to learn than to analyze mistakes. Take students through the error analysis process, and let them take lead of the questions through open dialogue with peers to really comprehend the "why" and "how" behind each of their problems. Take Stacey Muller for example, who used our "show your work" feature to allow her students to analyze a question that had been completed incorrectly. Students then had to correct the mistake and explain the "how" and "why" behind their new solution, not only building new understanding but building off of misconceptions and generalizations. How do you utilize error analysis in your classroom? Share with us on our Facebook or Twitter page or leave a comment below. We'd love to hear from you! Using Formative Responses To Drive Discussion! 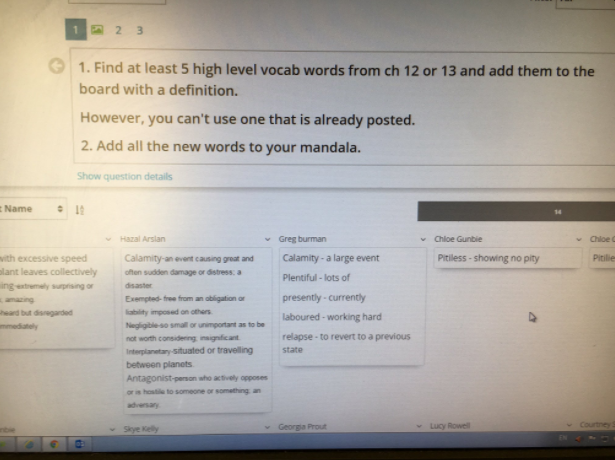 It's easy to see why teachers love projecting student responses on Formative. Instead of pulling notebooks to put under a document camera to share, you have every student response at your finger tips. This makes it easy to encourage students to explain their thinking or interpret peer thinking! Plus, you can hide names and scores so students can focus on what they can learn from each other rather than who got it right vs. wrong! In Ms. Roache's pics below, amazing discussions emerged when students were asked to compare the black and white pieces of a whole! How Would You Catch A Giant Squid? Use Formative! How would you catch a giant squid? This is the question that Mark Schlaudt posed to his students and it quickly turned into a STEM project! His students used Formative to create digital blueprints of their contraptions before building actual prototypes! How cool is that? Mark's students discussing the digital blueprints they built on Formative! Students build prototypes, bringing their Formative squid-catching blueprints to life! Want to learn more about Mark’s fun STEM project? Follow the link below! (The original post is from Dawn's new blog and she let us post it here so other Formative teachers can learn from how she used Formative for her first Breakout ! You can bookmark her blog as a great resource for all things "Math and for Math" and follow her on Twitter (@MrsFrier)! 1. A Google Form with some questIons to get them warmed up. When they have answered them correctly and submitted the form, then they will get the link to a web page with the next clues. 2. On the Web Page: http://mrsfriermath.blogspot.ca/p/integers-break-out.html they will find the receipt and a web page taking them to the next form with the digital locks that they can solve with the information from the web page. 3. Once this one is submitted correctly, they need to go elsewhere in the school based on the clues given and find the paper with the next piece. 4. The questions on the page will allow them to solve the lock on another Google form listed on their page (in shortened form). 5. That form will direct them to a Google doc with the text messages that have the clues to solve the questions available in GoFormative assignment. There are four questions and each one gives them one part of a location. In this case they have to go in sequence as I won't give them the clues out of order. 6. Because mine was a "crime" involving them having to find these "people" I hid people cutouts in their final location. 7. Once they found them, they had to bring them to me, and give the location in the final GoFormative question then put them back for the next group. That released the prize which happened to be small Gingerbread men (same shape as my people cutouts). From Genotypes to Phenotypes: Go Beyond MC With These 4 Formatives! Mendel, the father of genetics, was able to identify patterns in peas and predict the traits that individuals inherit. And with the 4 genetics formatives below, you'll be able to spot trends in student learning and help your young scientists over the course of a learning unit! They are especially gene-ial is that they are made for different stages of a learning unit and give students creative ways to demonstrate their understanding. A. This exit slip by Alyssa Greenwood is a quick way to see if your students understand the difference between the major terms they'll use to describe what they are learning throughout the course of your unit on genetics! B. Here's a fun formative by Mr. Patrick Irvine that lets student demonstrate what they've learned from Mendel's experiments! The word bank is a great way to support the acquisition of unit vocabulary! C. This quick quiz from Alysssa Moody is great to give while students are still learning how to complete punnett squares! Check out the helpful steps on the left! D. As you wrap up a unit on genetics, try this unit assessment from Alyssa Moody. She's on a roll! She gives image-based multiple choice questions which can be auto-graded. And now that students have gotten more practice with completing Punnett Squares in the context of Mendel's experiment, she asks them to apply to a new context without the steps given! Here's an alternative Honors version of the same assessment! Don't forget to grab a copy of each of these 4 ima-gene-tive formatives! Remember that you can edit your copies to make them work for your learning unit and student groups! Got another awesome formative on genetics or another topic? Tell us about it on Twitter or share it in the Science channel on our forum! Bonus points for being the first one to post there! 3 Formative Exit Tickets That Let Students Self-Reflect And Help You Plan! Can you believe it? Only 1 day left till Thanksgiving! As the leaves drop from trees, this is a great time for self-reflection! So we gathered 3 special exit tickets to help your students reflect on their learning at the end of class. What's special about them is that they let your students quickly communicate their overall learning progress according to a scale and reflect on a deeper level as well. Grab a copy of Sara's folder of formatives here! It contains this one, "How Many Bars? ", as well as plenty of other learning reflection activities! 2. Next up, Veronica Enriquez created a formative that let's students share their level of mastery according to a 4-point scale! What's great about scales like these are that you can also use them for grading rubrics so students can compare your evaluations and their self-reflections easily. It's also got an awesome follow up question that can help you validate the level they picked! Here's a copy of Veronica's formative! Feel free to modify it for your students! It won't affect her original! 3. This last one comes from our Formative co-founder and former 8th grade Science teacher, Craig Jones! This one is great because Q#2 let's students practically reflect on what skill or concept they are leaving class with! Q#3 is a great follow up because it allows students to show it! Your formative account already comes with a folder ("Pre-Made Checks for Understanding") containing this formative, "Exit Ticket: Self-Evaluation", along with others! Formatives like these are awesome because they provide you with the insights you need to have quick follow up conversations with your students and work with them to set personal learning goals. Got a creative learning reflection formative you'd like to share? Submit it here! We can't wait to check it out! Sharing Formative With Others? Here's 7 tips! Formative has evolved over the past two years, but the key ingredients for effectively sharing it with others have stayed the same! After asking hundreds of our educators, we've gathered 7 presentation tips that are sure to get your audience excited to used it. Disclaimer: They may actually jump out of their seats with joy, screaming "GoooooFormative". Don't worry, it's a good thing! One way to quickly show teachers the power of Formative is to let them pretend to be students and take a formative. When they see their own live responses appear on the screen, an audible "a-ha" moment happens; teachers realize they can tap into student thinking and immediately give them what they need so they can learn more! Click here to get a copy of the demo formative we've made! It's quick, fun, and has a variety of questions! Here's one of the questions from our demo formative! -Set an answer key, let Formative take care of the grading, and give scores back instantly! We've found that teachers appreciate ample time to explore features, and build a formative they can use with their actual students. During this time, teachers can also ask you questions about using Formative in their own classrooms and also send us a message over site! Here's a video which shows how to use Formative in less than 5 minutes! This modest but mighty Google spreadsheet has well over 1000 formatives for teachers to choose from by subject, grade level, and standards/skills. The formatives are organized in descending order by grade level and you can use the find hotkey on your PC (crtl and f) or Mac (command and f) to search a section by keyword! As you can see, our library has formatives for many subjects! Don't see one? Let us know! We've got a ton of how-to resources for teachers to dig into on top of messaging us over the site! Apply to be a Formative Educator and you'll receive exclusive access to our new version, updates on our game plan, invites to our internal team meetings, and even future opportunities to present! All in all, it's a great way to form a deeper connection with our team, stay on top of the latest, and share inside info with your audiences! Plus, did we mention you get a digital badge? Even after an awesome presentation, teachers might still have questions about using Formative for the first time with their actual students or feedback on their initial experience. We encourage you to check in with them and always feel free to bring us in on the conversation too! 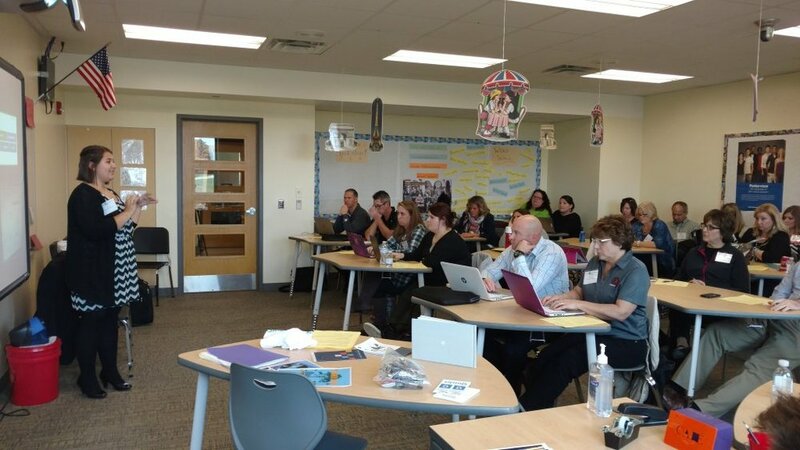 We love to help and learn from teachers actually using Formative! You can message us over the site by clicking on our Intercom! Here's our PD (presentation) pack which has materials which align with these tips! Got more? Tweet to us or message us over the site! We'd love to share them! HS French and Spanish Teacher Rachelle Dene Poth argues for more student voice, choice, and leadership when finding the right materials for every student. One of her students, Cassy, a 9th grader in Spanish I, reflects on what she's learned from that experience. Resources are everywhere: Where do we start? Teachers work hard to find diverse resources to help students learn. Supplemental materials can be found in textbooks and other resources, through a quick search online or implementation of teacher-created or student-made materials. An online search will result in a tremendous list of resources which includes webpages, images, documents, videos, and other media formats for a teacher to choose from. It seems simple enough, but it really isn’t quite that simple. The challenge is finding the right resource for each student. Being able to do this requires more than just conducting a simple online search. It requires that we truly know our students and understand their needs. Students do not all respond the same way when it comes to learning and feedback and developing these relationships will help teachers to provide the best learning opportunities. Finding something that will enable each student to have an opportunity to grow, receive personal feedback, to experience learning multiple ways, is something that teachers strive to provide for their student. Choosing tech tools for students is a good starting point...but what’s the next step? Technology offers many ways for teachers to differentiate instruction through digital tools. The number of tools and the features available changes every day. Finding something that works for everyone may take a little bit of time, and it involves some risk taking, flexibility and reflection to truly find what works best for each student. And while teachers are good at determining what might work best for their students, it is important to hear from the students themselves. Asking the students directly what helps them to learn better, stay engaged, and feel challenged will enable teachers to differentiate instruction and provide appropriate opportunities for all students. Student voice in how they learn and their opinion of tools used in the classroom offers the teacher valuable information and different perspectives. So it is worthwhile to take the time to investigate some tools, ask the students to try new things and then see what they think. Rachelle's students drawing a watermelon with our "Show Your Work" drawing tool! So I wanted to know, what do students get from the choices they are given? Does it make a difference? What helps the students to learn? A few years ago I started giving the students different options for how to complete a project or an assignment. Other times, rather than assigning a worksheet for homework, they had other options such as creating a game, participating in a classroom discussion online, or even the use of blogging, all which made learning more personalized and meaningful for each student. I value the feedback that I receive from the students and when I try something new, I always want to know what they think of it. In order to learn more about student needs, I decided to have one of my students become the teacher, create a lesson using Formative, and share their thoughts about the new experience and the benefits. Cassie getting ready to show tech tools that help her learning "catapult". Cassy: I believe technology is an important part of learning and is a great asset to teachers and to students. Technology allows students to have the freedom to choose how to do projects, homework assignments or other classroom activities. This freedom allows students to thrive and do the best they can. I know that I love the process of finding a new website, game, project or teaching tool that I can use to help my learning catapult. It is also fun to explore the possibilities of technology and what it offers me. I can be creative and innovative. Classes which integrate technology are completely different than those which do not, because they provide more opportunities for students to learn. Formative is a great example of the infinite possibilities technology can offer students and teachers. Documents, websites, pictures, questions and drawings are integrated into this program which allows for differentiation and creativity in various ways. Also, many people can participate in one formative assignment. The teacher or creator of the formative can see individual responses and work with the student one on one and provide personal feedback. Formative creates an effective learning experience while keeping a fun atmosphere. On May 16th, 2016, I participated with other students in the PAECT (Pennsylvania Association for Educational Communications and Technology) student technology showcase, where students from Pennsylvania showed how they use technology to its fullest potential. I made my own Formative and allowed others to try it, and highlighted all of the different uses and how effective it is for education. I enjoyed sharing how a digital tool like Formative can provide different learning activities, enhance how students learn and how teachers can teach. I feel that making students turn off their phones or computers is not fair and is not smart choice. Teachers do that for their benefit, not for the students. The current generation of students is extremely involved and knowledgeable about technology. If all teachers could dive into the world of technology and understand its importance, significance and benefits, and then take the time to explore new ways to integrate some technology into class, it would make a huge difference in a student’s learning experience. I don't know why more teachers don’t use technology to teach because it is a way to get the students more involved in the learning material. I want teachers to empower, engage and inspire me. I want teachers to give me the freedom to be creative while I am learning. I want teachers to make learning relevant to my time, and my life experience. Technology is the way to do that, to get students involved. It allows me to have my own voice and learn in the way that is best for me. I do not want to be held back from the infinite possibilities that technology offers any longer. Rachelle: It is clear that students have opinions about technology and its benefits. Having choices in how to learn, being exposed to different learning tools and styles, and receiving feedback are all benefits of technology integration and ones which positively impact students. When they have opportunities to work with technology and choose how they learn, including them in the conversation and asking for feedback empowers students even more. Since students are the group most affected by the technology used in the classroom, we need to hear what they have to say.